Skill and compassion go hand in hand when providing exceptional patient care. As one of the top dentists in Tulare, CA, I stay up to date on the latest advancements in dentistry in order to provide the most current treatment options for my patients. As a doctor, I recognize that my patients are unique individuals who have placed a great deal of trust in me and my team. That is just one reason why I value each and every patient relationship. I appreciate the time you’ve taken to visit this site and find out more about this dental practice, my team, and the many services we can provide to help you achieve optimum oral health. Contact our office in Tulare if you have any questions! 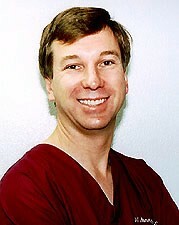 Dr. Humerickhouse was born at R.A.F. Station Burtonwood, England and eventually moved to El Cajon, California where he graduated with honors from Santana High School. He earned his Bachelor of Science Degree in Chemistry from San Diego State University, followed by his D.D.S. degree from the University of Southern California Dental School. Since that time, Dr. Humerickhouse has spent countless hours on patient care, as well as specialized studies, in his pursuit to develop a truly excellent dental practice. A hallmark of his work has been his attention to the latest technological advances. Constantly trying to improve and ensure that his patients have the best experience possible, Dr. Humerickhouse is continually incorporating the most innovative, proven tools of the trade into his practice. This interest in providing "the very best" for his patients also translates into the continuing education studies that he chooses. He has completed 2 years of advanced Esthetic Dental studies at UCLA, orthodontics and craniomandibular orthopedics, and a mini residency in implantology. Dr. Humerickhouse loves his career choice and looks forward to many more years of service to his patients.